was born in the south of Germany in 1902 and during his early years acquired a love of the mountains and snow, becoming proficient in both skiing and mountaineering. He emigrated from an economically depressed Germany in 1927 to New Zealand, initially finding work as a ski teacher at The Hermitage, Mt Cook, and then in 1929 moving on to Arthur's Pass - this coinciding with the establishment of New Zealand's third National Park.The Otira tunnel had just opened in 1923, and given the lack of private motor vehicles and the consequences of the Depression, the Midland Railway Line through Arthur's Pass Village provided easy and economical access on the daily passenger trains and the very popular weekend excursions, both for recreation and holidays. Cottages left over from the tunnel drilling years were becoming holiday baches, and Guy Butler set up an accommodation hostel. 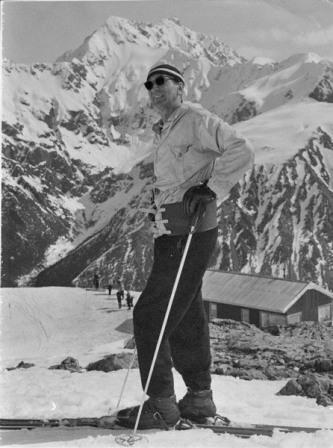 Oscar saw considerable potential for the Park to become an alpine getaway location, providing readily accessible slopes and peaks for Christchurch's sport and nature lovers. Following his arrival in the Village he built the little two-roomed European style cabin which is at the core of today's Wobbly Kea Café, and was joined by his fiancé, Dagmar, from Europe, together raising three children. He established a successful business from this house, providing skiing lessons, mountain guiding, and was a pioneer in the importation, retailing and servicing of climbing and skiing equipment. 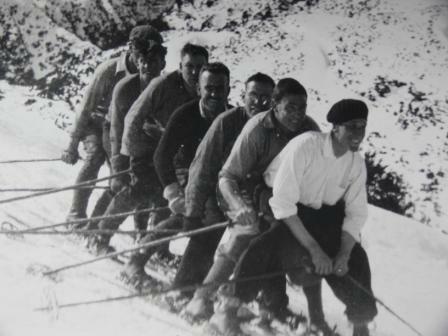 As the family and business grew, the original cottage was expanded to become the outline of today's building.Oscar had acquired, whilst still in Germany, the rudiments of the fabled "Árlberg" ski technique - which remains the foundation of today's style - and was in popular demand for instruction to the fledgling Christchurch Ski Club, founded in 1929, first on the "Lower Ski Grounds", near the Dobson memorial, and later in Temple Basin, where the higher altitude contributed to a more reliable and larger snow cover. 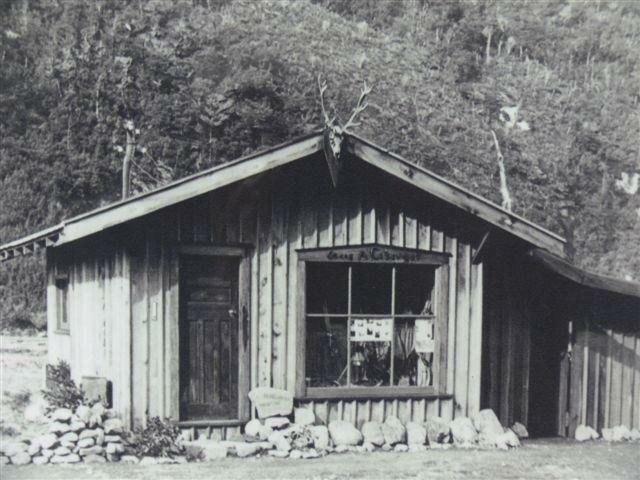 Oscar held a very respected reputation for his imported quality climbing and skiing hardware range, and from the 1930s to the 1950s travelled extensively through the country introducing his wares to the scattered ski, mountaineering and tramping clubs, the despatching of orders being conducted from this building. He had secured many particularly good agencies at a time when the availability of such material in New Zealand was in its infancy, and it was but a matter of course that the likes of Ed Hillary and George Lowe, and their climbing compatriots, purchased their first ice-axes from Oscar.He enjoyed a long and accomplished mountaineering career, from being in the first party to traverse Mt Rolleston's Rome Ridge in April 1929, through to climbing Mt Cook, 3754m, at 65 years. In 1978, at age 76, and accompanied by his son and grandson, Oscar made his last climb of Mt Rolleston, 2275m. He passed away in his sleep in this house on a winter's night in 1982, after organizing a skiing trip to Porter's Heights the following day.